Song's experience with half-a##ed welding prompted this post. Hornhospital had some advice and I'd like to put it in the appropriate spot to get opinions on stick, MIG, TIG and gas. If you have any intention of welding aluminum or stainless, TIG is pretty much the only option. It will do steel of any thickness (provided it has enough amperage for the thick stuff). Body panels are no problem, but remember, with a TIG YOU are the wire feed. You can't "stitch" as easily as using a MIG that feeds the wire for you. For general welding that can range from body panels to heavy frame welding, MIG is what you want. Stick can work, but it is really difficult and messy on thin material. Regardless of method, make sure you get a machine that has a decent duty cycle. Any of the name brand machines will be ok in that respect. I'm partial to Miller products, but my oldest machine is a Lincoln stick welder that's going on 55 years old. Saw this before, but finally getting around to saying something. The way to go is a multi-function MIG. TIG is the most flexible, and gives a fantastic result, but you must practice a lot to get good with it. Aluminum is also a bugger to learn to weld well. If you have a really nice MIG with a spoolgun, you can much more easily get aluminum fixed than with TIG. Most of what I do is using MIG, although when I need the TIG, there is NO substitute. Al that said, what kind of money are we talking? Well, I think these are the choices. If you mostly need to weld "regular" steel and stainless, then you should look at the Harbor Freight Vulcan line of welders. They are new this year, and reviews by working professionals say they are built like a current generation Miller or Hobart, at a great price point. You can get a spoolgun for them too, which makes aluminum welding possible. If you are dead serious about your welding, then I would recommend something like a Miller Multimatic 200. 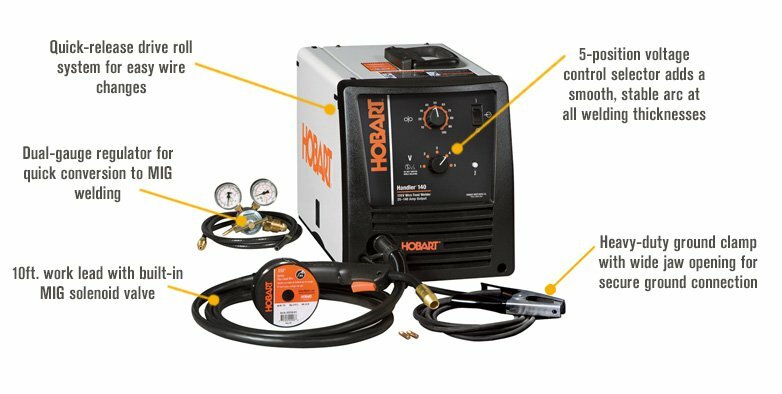 MIG, TIG, stick, that machine can do it all, but cost is upwards of $2500 by the time you buy a complete setup with tanks. - Runs on 110 outlet. for doing car bodywork, general fabrication in up to ~1/4" plate and if you are starting out a single-phase hobby MIG is IMHO the best choice. You can spend a lot of money on something with knobs, bells and whistles and you might never use them anyway; not everyone takes to welding or needs to do the (few) welding jobs that are best accomplished via TIG. BTW buying a more powerful MIG set than you need often makes it less suitable for low power jobs like car bodywork. You can do a lot with even a 100A set, including weld stainless and (with some models) you can weld aluminium too. Although I have a choice of about seven different welding sets, to this day my go-to machine for car bodywork and all kinds of other small jobs is a fairly basic 90A set. It just allows precise welding because it starts and stops briskly (relay-controlled sets often don't), has useful controls, and has a very compact torch that gets into small corners that is fairly miserly with gas consumption too. MIG weld beads can be dressed by grinding, at which point you will find out if the weld beads are really sound and you can make the final job look as good as you want. - MIG welding with CO2 or CO2 mix is quite tolerant of small amounts of rust and contamination on steel, in stark contrast to TIG, where you will soon start using the tungsten as a consumable on the same jobs. - If you are a skilled welder and you want to leave your (benchtop fabricated) weld beads 'on show' TIG is best for that. - the fit-up of parts needs to be x5 or x10 better when TIG welding than in MIG welding, esp in stainless. - when MIG welding you can often hold the parts with your unused hand, so no fixtures required. Unless you have a spool gun (expensive to run because you need small spools of wire) TIG cannot do this; everything needs to be clamped or tacked. - some cheap MIG sets turn only the wire feed on and off, leaving the contact tip live even when you are not welding. Such sets are comparatively rare these days and can be avoided without spending a lot of extra money. In the blurb it should say 'dead torch' if the welding power goes on and off with the wire feed like it should. Always check this when looking to buy a machine. - You can MIG weld stainless steel using Ar/CO2 mix. - if you are welding out of doors any kind of breeze is a problem for a gas shielded process; temporary shields are required but you can do a lot by shielding the work using your unused (gloved!) hand when MIG welding at low power. - You can buy cheap machines that use the (oxymoronic) 'gasless MIG' process. The one good thing about this is that you can weld in a breeze and you don't have to worry about having a bottle of gas. But the welds are often shite, running costs are horrendous (spools of wire are x5 ore expensive and weight for weight you get less than half the weld metal deposit), there is more UV emitted, the fumes are more poisonous and the torch (bereft of cooling gas flow) will overheat more easily. - If you want to fabricate occasionally in 1/4" to 1/2" thickness steel, a stick welder (MMA, flux shielded) is a good way of meeting this objective at low cost. If you use the correct rods they are easy to store and there is no gas to worry about. Levels of difficulty go up in other materials and may vary with the specific task. Much good food for thought. I normally get expensive equipment if I'm doing a lot of something - especially worth it for car welding as thin metal is the most difficult DIY welding IMHO. Sounds extravagant but the work will be much easier and better and you can normally get most of your money back on good second hand equipment. I joined a mig welding forum years ago and it's been so helpful over the years as most people on it do exactly the same kinds of things as us - so there's normally good info on all kinds of tools and tasks. Buy the best second hand equipment you can off one of the forums, sell it when you're finished. The welder I have is a Jasic Pro 160 inverter with self fluxing wire. It's not quite as easy as using a gas bottles but it's quarter the size. I'm sure you know this but good leather gauntlets are a must and auto welding helmets are great - not worth spending much on one as they are all pretty much the same...unless you're a pro. Don’t buy anything less than 150amp gas mig welder. Flux wire is useless. It will not give you a constant clean flow. Find a used one on ebay. You’re wasting your money buying new if your just doing the odd one off jobs. I use a Lincoln 175 MIG. I run it on 220. Picked it up in a hock shop, with a bottle for $250. I had to change the wire feed hose to make it right and it welds super nice. The only other addition was a $35 cart from Harbor Freight and a roll of wire. Lot of good tool buys in hock shops if you have the patience, as much of the stuff in there is probably stolen and either very close to new or close to very close to new. I also have picked up a lot of Snap On stuff as mechanics get in bad financial shape and just dump stuff to get quick money. Don’t buy anything less than 150amp gas mig welder and don’t use anything less than Argon 5 with 10 litre Bottle. Using small Bottles is a false economy they don’t last. Flux wire is useless. It will not give you a constant clean flow. Find a used one on ebay. You’re wasting your money buying new if your just doing the odd one off jobs. Lots of guys sell their sets on ebay when they have finished a restoration allowing you to pick up a bargain.